The flowers are in full bloom, we’re harvesting organic veggies, and we’re enjoying the long summer evenings that allow for a walk in the forest after evening meditation. Check out summer at the Abbey. 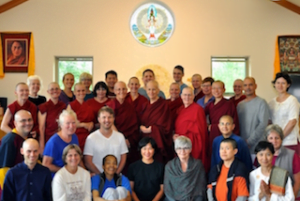 Over 35 people attended the week-long Medicine Buddha Retreat. We meditated on the Medicine Buddha to heal ourselves physically, emotionally, and spiritually, and extended that healing energy to the world. See photos here. Venerable Chodron gave teachings on equalizing and exchanging self and others from Shantideva’s Engaging in the Bodhisattvas’ Deeds . Shantideva speaks directly to our hearts with straightforward arguments about the disadvantages of self-centeredness and the benefits of cherishing others. Although our self-centered mind tries to divert the message, thinking, “This is for other people, not me,” there’s no escaping the force of his truthful words. Shantideva brings the wisdom realizing emptiness into this method for generating great compassion and bodhicitta, which people found very moving. Listen to the talks here. Speaking of retreat, Venerable Yeshe just returned from a solo meditation retreat at Old Goldmine Hermitage. Venerable Chonyi did a “work retreat,” staying in Shanti Cabin in order to work undistractedly on our new website. Stay tuned for its release date; it will be gorgeous and make it easy to find the Abbey teachings and retreats you’re looking for. This month’s Sharing the Dharma Day focused on working with habitual disturbing emotions, a fitting topic after a week that saw the murders of two African-American men and five police officers. When our minds are upset, we don’t communicate or listen well, and our actions can easily make the situation worse. Since America needs to heal, we need to pacify our afflictions first. Then with a clear mind and compassion, express ourselves in a way that others can hear. We don’t need to agree in order to live together peacefully, but we do need to respect each other. Realizing that everyone wants happiness and not suffering, and that everyone has the potential to become Buddhas, we need to speak about ideas and actions without criticizing or disrespecting the people who have them. Inspired by our neighbor Bon’s Bodhisattva’s Breakfast Corner talk, Venerable Damcho, Venerable Tsepal, Stephen and Hsiao Yin visited the North County Food Pantry to see their operations in action. They arrived in a flurry of activity as volunteers received and sorted food donations, including some from the Abbey. Bon and Sandy, who is in charge of running the food pantry, took the group on a tour, showing the many extra services the food pantry offers to their clients, from free medical equipment, to laundry and haircuts. The Abbey group marveled at the food pantry’s one-acre garden run by enthusiastic volunteers, which produced four tons of fresh produce last year! The tour ended with a snack made by volunteer chef, Kassie, who cooks free healthy meals at the pantry weekly. Kassie even visited the Abbey the following week to teach us how to bake gluten-free bread. Everyone was moved to see so many joyful, good-hearted people coming together to take care of those in need in our rural community. As part of our mission to promote human values, understanding, compassion and peace within society, Venerables Semkye, Chonyi, and Jampa recently attended a reception held by Alliance for Gun Responsibility on Initiative I-1491 in Spokane. This initiative advocates for commonsense gun control. It empowers families and law enforcement with tools to prevent firearm tragedies while protecting due process rights and closes loopholes that allow abusers to access firearms. I was invited to teach the English Dharma class at a four-day retreat organized by the Vietnamese Unified Buddhist Congregation of the United States of America-Canada at the Hilton Hotel in Orange County, California. About 500 people attended—monks, nuns, and lay followers. Most of them participated in the Dharma classes in Vietnamese taught by well-respected and learned Vietnamese masters. I was also invited to give a talk at the plenary session on the last day. The participants in my class were mostly Vietnamese young adults as well as some American and Vietnamese adults. 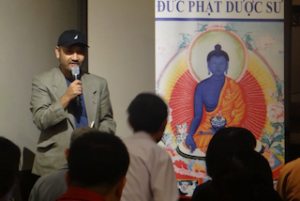 My talks focused on the Buddhist worldview as well as on how to subdue disturbing emotions such as anger. Everyone listened attentively, and the young people especially asked thoughtful questions. In one session, we got into a stimulating discussion that applied Buddhist ethics to issues in modern society. I’ve always been grateful to Asian immigrants and their American-born children who brought Buddhism to this country. On the walls of the main hallway of our area in the hotel were pictures of some of the many Vietnamese temples located all over the USA. I was impressed by how many temples there are in very diverse locations of the country. The faith the Vietnamese community has in the Three Jewels is evident, as is their dedication to making the Dharma available to many people. 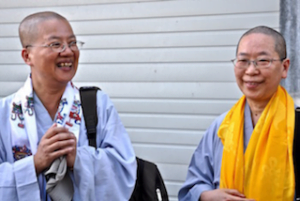 Venerable Chodron shares about connecting with the Vietnamese Buddhist Community on the Bodhisattva’s Breakfast Corner. Photos are here. Venerable Chodron’s newest book, Good Karma: How to Create the Causes for Happiness and Avoid the Causes of Suffering will be in bookstores beginning August 9. Good Karma is Venerable Chodron’s commentary on “The Wheel of Sharp Weapons,” one of Tibetan Buddhism’s great thought training poems. Venerable’s commentary shows clearly and practically how to eliminate the causes of anxiety, fear, and depression and to create the causes of joyful liberation for self and all others. 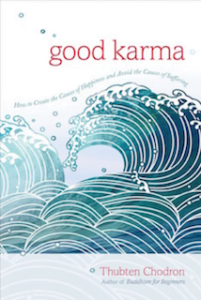 Good Karma will be featured on the New Paperback table in Barnes and Noble bookstores from August 9-22. It’s available now from Shambhala Publications and at the Abbey. Amazon and major bookstores should have it next week. We were privileged that two of our bhikshuni friends visited us for a few days. Venerable Jendy is the director of the American Evergreen Buddhist Association in Kirkland, WA, and Venerable Jenkir is the Vice-President of the Buddhist Institute of Luminary Temple in Taiwan. Both are senior nuns, and between the two of them and Venerable Chodron, there are over 100 years of monastic life and experience. Venerable Jendy, in particular, has been advising and supporting Venerable Chodron regarding how to establish an Abbey in the West for over 25 years, long before we found the land. Venerable Master Wu Yin, their teacher and the Abbess of Luminary Temple, has also been very supportive, especially in terms of teaching the bhikshuni monastic discipline to Western nuns. We enjoyed discussing the Dharma with them, and appreciated our informal discussions about monastic life. They also helped us to refine our chanting. At the same time, they marveled at the English chants we have set to Chinese melodies. 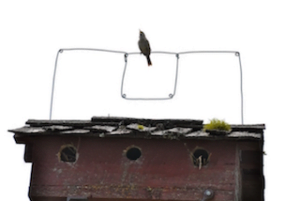 Listen to the bhikshunis’ Dharma sharings here and here. Photos are here. Our summer work in the forest continues, and as we take out crowded and dead trees so that sun and water can reach the remaining trees, we’re accumulating a pile of firewood for the winter. When you drive up Country Lane, you’ll notice the forest on your right is more spacious, due to the help of many volunteers. On July 15, Hsiao Yin from Singapore received the eight anagarika precepts and head-shaving. She joins Stephen and Alicia in the year-long anagarika training period at the Abbey. Hsiao Yin spent several months with us last year, then returned to do the winter retreat. Now she takes another step in her training. We welcome her back and delight in sharing the Dharma and training with her. Photos are here. If you’ve taken the shuttle from the Spokane airport to our town of Newport, you are familiar with the Abbey vehicles. We try to use the 2000 Subaru, but sometimes you get to ride in one of the old trucks. A recent visitor made an offering for a mug and told us: “I am new to the Dharma and don’t know much, but I drink tea all day. 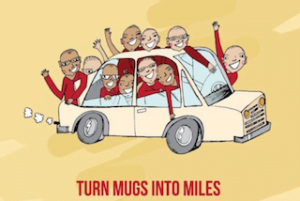 Just looking at the mug with the Abbey logo reminds me of kindness and the things I’ve learned so far.” Read Kuni’s letter and support the project here. 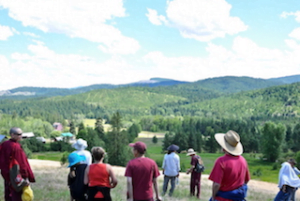 The Friends of Sravasti Abbey offer service in many ways all year long. We are grateful for your support! 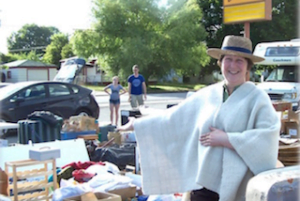 The CdA Dharma Friends and volunteers from the UU Spokane meditation class pitched in to run the annual Almsbowl Rummage Sale to benefit the Abbey food fund. The sale was highly successful and it appears everyone had a great time doing it. July’s Offering Service Saturday brought a crew of volunteers from many local places. They helped by working in the forest, harvesting and cleaning up the garden, baking bread, making prayer beads for inmates, processing dried fresh herbs—the list is long. Everyone had a great time and the Abbey really benefits from the help. Thank you, everyone! The next one is September 17. Sravasti Abbey Friends Education is a distance learning program for deepening your learning and stabilizing your practice. A new semester starts September 19. Sign up soon, as classes fill fast! Read about the advantages of bodhicitta and how to age happily by Venerable Chodron. Check out Stephen’s latest poem, “Figure-ground,” which came about due to an architect meeting the Dharma. HH the Dalai Lama gives a short and valuable teaching here. Read Palza’s poem, “The Conversation”, and see if it describes what goes on in your mind too. 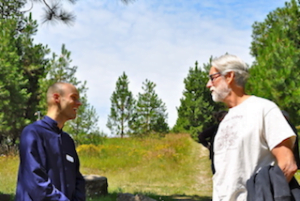 Ken tells us about his “Wake-Up Call” to practice the Dharma. Many visitors stream through the Abbey in summer. This year we’ve had quite an international crowd. 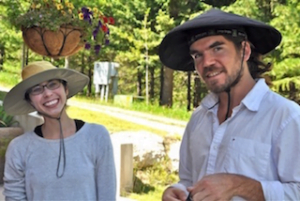 Guests included WWOOF-ers Pablo from Chile and Sainath from India, who now works in the U.S. A family from Scotland, now living in Canada, dropped by for Offering Service Saturday. Ron from Singapore (now living in Hong King) stayed after the retreat, and Marissa visited from Australia. Early arrivals for Exploring Monastic Life hail from Australia (via New Zealand and Germany), the Netherlands, and Mexico. Our old friend Sherran from Canada returned for a nice long visit, and new friend Karen came from Chicago for a few days. Several local friends came for short visits too. We’ve enjoyed sharing the Dharma with every one!